Partie Orientale de l'Empire Romain. The Roman Empire was established in 27 BC after Gaius Julius Caesar Octavianus, the grandnephew and heir of Julius Caesar was awarded the honorific title of Augustus. During the time of the Empire, Roman cities flourished. Trade spread as far as India, Russia, China and Southeast Asia. However, the sheer size of the empire and its success also contributed to its downfall. The Western Roman Empire collapsed in AD 476, when Romulus Augustulus was deposed by the German Odovacer. The eastern Roman Empire, evolving into the Byzantine Empire, survived until the Ottoman Turks captured Constantinople in 1453. Constantine ruled the empire from 306 to 337 AD. The first Roman emperor to convert to Christianity, and the foremost general in his time, Constantine was responsible for building New Rome, the new seat of the empire, replacing Byzantium. Constantinople, as New Rome was popularly called in honor of Constantine would become the capital of the Eastern Roman Empire for over one thousand years, leading to the belief that Constantine founded the Eastern Roman Empire. He was also responsible for introducing the gold solidus, a new stable currency that developed the economy. 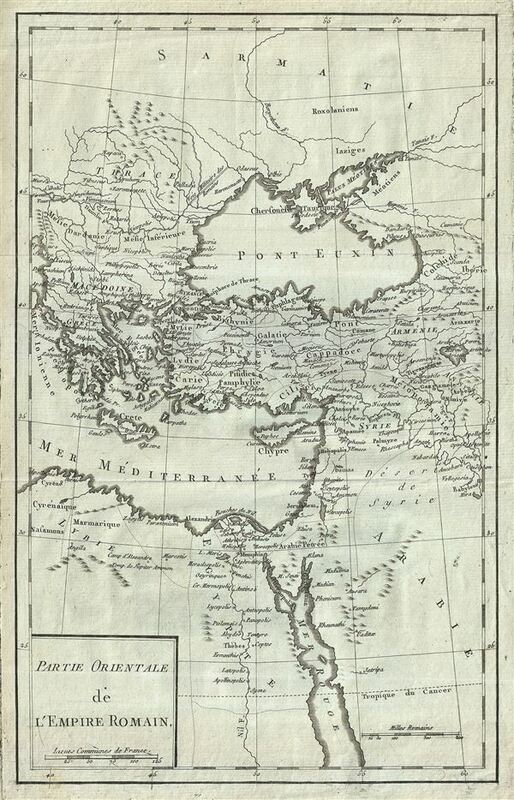 This map was issued as part of Delisle de Sales'Â Histoire des Hommes. Partie de l'Histoire Moderne. This volume is exceedingly rare as most of Sales' work was burnt under the censorship of heresy.